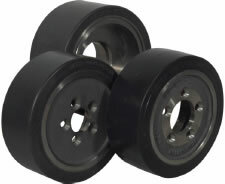 For extreme applications we offer VULKOLLAN® Quartz wheels for ultimate traction. Considered as the only alternative for the toughest applications in the fish and meat processing industry, or in dairies. They are manufactured by adding quartz sand in a special production process, and are therefore also often known as “quartz wheels”. VULKOLLAN® quartz wheels are often used on extremely humid, smooth floors and in operations where there is a danger of icing, e.g. in cold stores. VULKOLLAN® Quartz has an abrasive effect and should therefore not be used on sensitive or coated floors.